From the rookie list to a premiership, track the career of the retiring Brent Macaffer. Leading by 25 points at three quarter time, a fadeout in the final thirty minutes cost Collingwood who fell to an eight-point loss to North Ballarat on Saturday. Collingwood’s march to the VFL finals officially begins on Saturday afternoon as the Magpies play the first of three consecutive games at Victoria Park. One of the success stories of the 2010 premiership team, Macaffer re-established himself as a senior player three years later as a tagger in the midfield. Such was Macaffer's consistency in 2013 that he ran sixth in the Copeland Trophy after stopping the likes of Nick Dal Santo, Josh Kennedy and Joel Selwood in their tracks. In the twelve months that followed, he established himself as one of the finest taggers in the competition and, importantly, became an underrated leader in Nathan Buckley's young Collingwood outfit. He still has the ability to play in a variety of roles at half forward and at half back, marks extremely well overhead and is difficult to beat one-on-one. Macaffer has a tendency to break tackles but make his own stick, and when in form is a reliable shot for goal. A knee injury in the penultimate round of 2014 prevented him from any senior action in 2015, however strong form during his return to the VFL in the latter stages of the season signalled positive signs towards a future return. Macaffer’s 2015 campaign was effectively over before it started after as he recovered from the ACL injury sustained in round 22 the previous year. Collingwood training at the Holden Centre was not complete without the sight of Macaffer repeatedly jogging laps of the oval or engaging in individual recovery exercises. While he progressed naturally from the reconstruction, a setback in May saw Macaffer undergo further surgery on his knee and subsequently extend his time on the sidelines. A return via the VFL came in August with Macaffer sitting out the first quarter against North Ballarat before collecting three clearances and 15 disposals in the VFL Magpies eight point loss. 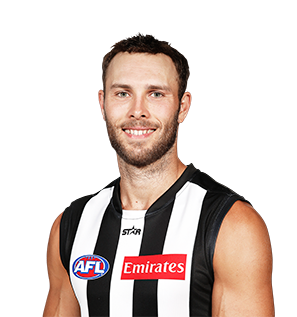 His output immediately increased in the final weeks of the VFL season as the 26-year-old played extended game time and was a major factor in leading Collingwood to third successive VFL finals campaign. He was one of the Magpies best players in the post-season, with three goals, 50 disposals and an outstanding 18 clearances spread across two do-or-die games against Werribee and Sandringham. Macaffer established himself as one of the most reliable taggers in the competition in 2013 but took his game to the next level in 2014, shutting down some of the game’s best players and earning his share of the media spotlight in the process. He played more than 20 games for the third time in his career, averaging 13.6 disposals and 4.1 tackles per outing. Although he managed just four goals, it was what he did without the footy in his hands that had the pundits talking. With every camera in Channel Seven’s arsenal trained on the MCG, Macaffer’s miserly approach to his craft caught the eye against Richmond on a wet Friday night in round four. Macaffer comprehensively shut down Tiger skipper Trent Cotchin, restricting the playmaker to just 13 disposals (at 46 per cent efficiency) – his third lowest tally since the beginning of 2010 – and left him visibly frustrated by the time the Magpies had completed their 38-point win. Much was made of Macaffer’s close checking tactics, particularly his ‘bear trap’ approach that saw Cotchin corralled at the stoppages. "It's difficult,” he explained to AFL Media post-match. “I got pinged for a couple out there that I thought were a bit touch and go, and thought I should've got a couple as well." Although he was firmly in the spotlight, Macaffer didn’t change his approach. He held 2012 Brownlow Medallist Jobe Watson to just 19 disposals on ANZAC Day and Carlton’s Marc Murphy to only 20 a week later. The only player to escape his clutches was Patrick Dangerfield, who collected 32 disposals and laid eight tackles during Adelaide’s 21-point win in round nine. Macaffer went on to keep Luke Shuey to just 15 touches in round 10 and Jack Steven to only 18 a week later, before shutting Melbourne’s Dom Tyson down (16 disposals) on the Queen’s Birthday. He did a fine job on Hawthorn speedster Bradley Hill (14 disposals and a goal) and fought hard against Gold Coast champion Gary Ablett Junior before laying a tackle that would ultimately end the dual Brownlow Medallist’s season. He remained one of his side’s most consistent players during the final rounds, collecting a season-high 23 disposals in the heavy loss to Brisbane in round 21. But Macaffer’s career has never been straight forward, and it took another unexpected turn in round 22 when he ruptured his anterior cruciate ligament in his right knee against Greater Western Sydney. 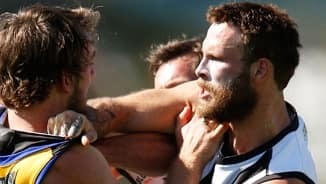 As fate would have it, the injury was sustained during a marking contest with former teammate Heath Shaw, against whom Macaffer was applying a forward tag. There weren’t many players across the competition who improved their standing in the game to the extent that Brent Macaffer did in 2013. He had played in only four of Collingwood’s 50 games post the 2010 Grand Final Replay and entered the year off the back of a knee reconstruction the previous February. In the space of 22 senior games, Macaffer entrenched himself in Nathan Buckley’s first choice team. He reinvented himself as a tagger after spending most of his career at half forward and shut down some of the game’s most respected midfielders. The first victim was Nick Dal Santo (held to 16 possessions). Next was David Mundy (10 possessions), and Joel Selwood (20 possessions), Josh Kennedy (18 possessions) and Pearce Hanley (10 possessions) followed soon after. He was one of Collingwood’s best in the Elimination Final loss to Port Adelaide, restricting Port’s Travis Boak to only 14 possessions. Macaffer missed only one game (against Hawthorn in round three) and played less than 80 per cent of a game on only two occasions. Suffered a similar fate to Andrew Krakouer when he went down with a left knee injury a week before in the opening round of the NAB Cup against the Western Bulldogs. The 2010 premiership player worked alongside Krakouer in a bid to get back playing and achieved that goal in round 19 in the VFL, but time worked against him and he failed to make it into the seniors. It was a second straight injury-hit year for Macaffer and he will be hoping for a change of luck after being given a one-year contract extension. If 2010 was the highlight of his short stint at Collingwood to date, 2011 was the polar opposite. Struggled to find any traction as he battled injury issues from the outset. Played in the club’s NAB Cup premiership and was the first substitute of the season in round one against Port Adelaide, kicking a goal within seconds of coming onto the field. Although he cracked his foot in round two, Macaffer spent three weeks in the VFL before succumbing to the injury and travelling to Arizona for a two week training camp. Returned via the VFL and after three weeks was rewarded with a senior promotion against Gold Coast in round 18. He lasted only one more week before returning to the VFL where he injured his back against Bendigo and missed selection for the finals. Was the definition of the term ‘breakout season’. Macaffer was a vital reason behind Collingwood’s premiership push. Played each game between rounds three and 12, returned to the VFL for three weeks before returning in round 16 and playing each of the remaining 10 matches. Played a handful of blinders in the second half of the year. Kicked three in the win over St Kilda in round 16 and buttered up with three more against the Tigers seven days later. Was a consistent contributor in the finals, quietly creating a series of important scoring opportunities. His ability to play tall and small, and act as a marking target in attack made him a nigh on irreplaceable cog in the Collingwood machine. Was solid in the drawn Grand Final, kicking a goal in the second term courtesy of a fifty metre penalty and kept a cool head under pressure when in possession late in the match. Had 14 touches in the premiership win and kicked two first half goals. Played with a groin injury that required weekly pain killers late in the season. Appeared during the NAB Cup against Richmond but left the field due to a migraine. Broke into the senior team on Anzac Day as a late inclusion for Alan Didak, goaling with his first kick in the opening term. Was omitted after round seven and didn’t reappear until the semi final against Adelaide. With the season on the line, Macaffer made a name for himself with a long goal on the run from outside 50m to keep the Pies alive. Goaled again the following week in the loss to Geelong. Kicked seven goals in the VFL, where he spent more time up the field in his 10 games. Missed five games mid-season with a knee injury. Enjoyed a fine season in Collingwood’s VFL team playing as its focal point in attack. Kicked 38 goals in 17 games, including a bag of eight against Werribee in round 17. Was named in the best in 10 matches, and tied with Justin Crow for the Joseph Wren Memorial Trophy as the Best and Fairest in Collingwood’s reserves or VFL team. Was promoted to the senior list at season’s end. Spilt his time between Williamstown’s senior (10 games, four goals) and reserve (11 games, 26 goals) in his first season on Collingwood’s rookie list. Played mainly at half forward and did enough to ensure he was retained for 2008. Played for the Gippsland Power in the TAC Cup U18s. Led the TAC Cup goal kicking table with 70 goals in 20 matches (was goalless in his first four). Kicked at least two goals per game in the last 16 rounds, and kicked five or more in eight matches. Named at full forward in the TAC Cup Team of the Year and polled 10 votes in the Morrish Medal. Drafted to Collingwood in the Rookie Draft with selection No. 26, and was likened to Sydney half forward Ryan O’Keefe with his ability to cover the ground but compete well in the air. Played for the Gippsland Power in the TAC Cup U18s as a bottom-age player and was named on the extended bench for their Grand Final victory but did not make the final team.